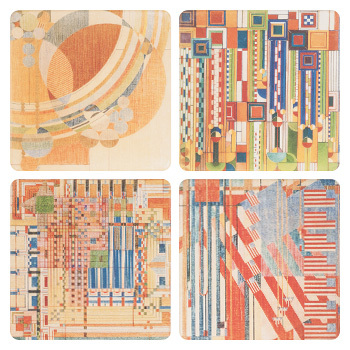 These coasters are based off the designs for various Liberty Covers Frank Lloyd Wright produced in the winter of 1926-1927. The designs were considered to be too avant garde and were never published. This coasters collection contains one each of the following Frank Lloyd Wright designs: Old Fashioned Windows, Saguaro Forms, March Balloons, and Fourth of July. Each Frank Lloyd Wright coaster is 4" square, made of original CoasterStones porous sandstone and is cork-backed to protect furniture and prevent scuffs.